Proboscis is collaborating in a series of labs, artworks and interventions with artist/curator Andrew Hunter of DodoLab. So far, DodoLabs have been run at the World Environmental Education Congress in Montreal (May 09); Confederation Centre, Prince Edward Island (Aug 09) the Guelph Jazz Festival (Sept 09), Rijeka, Croatia (June 2010). More labs and workshops are planned for 2010, including in the UK. DodoLab is supported by the Musagetes Foundation and the School of Architecture, University of Waterloo, Canada. 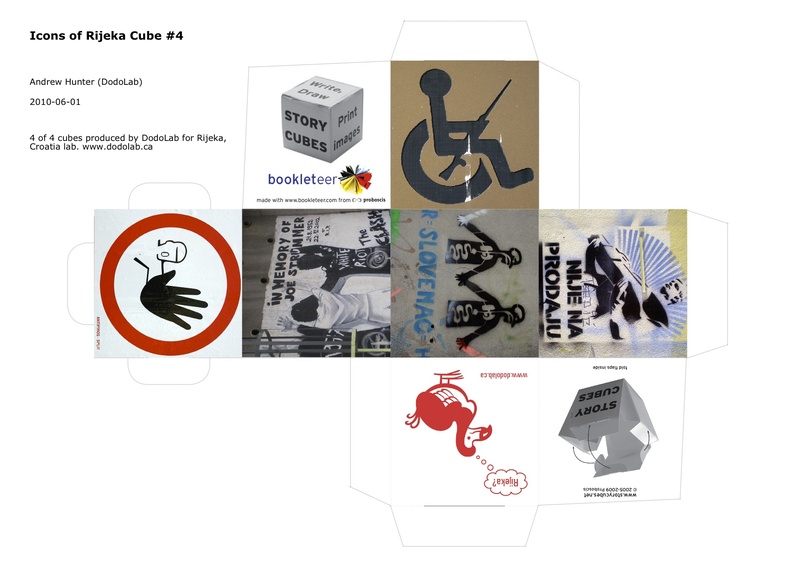 A continuing element of the collaboration centers on using bookleteer to create artists books, documentation, workbooks, storycubes and other publications about DodoLab and its activities which you can see and download them here. DodoLab was the founding member of the bookleteer alpha club. DodoLab is a dynamic and experimental project exploring issues of resilience in places undergoing change and urban regeneration. The lab creates performances, artworks, interventions, events and education projects through an engagement with sites and communities. They use communication and social tools (such as posters, tagging, personal media devices, puppet figures and outdoor cafes) that are ubiquitous in the city. The first DodoLab was held in Montréal in May 2009 at the 5th World Environmental Education Congress – a creative intervention in the exhibition hall and out and about in Montréal itself. Proboscis and the DodoLab team created a series of projects engaging the congress delegates in questioning concepts of sustainability. Giles Lane devised and a facilitated a social mapping and StoryCube activity engaging several hundred delegates in exploring their interconnections and ideas on sustainability and resilience. DodoLab PEI is was hosted by the Confederation Centre Art Gallery and explored green space in the city, notably the Experimental Farm which is due to be redeveloped. Proboscis took part in creating and distributed seedbombs at the local Farmer’s Market, designing books, and undertaking research into the Experimental Farm Station for our new work, In Good Heart, (by Alice Angus), which considered the shift from rural to urban and the perception of ‘farm’. In Good Heart was exhibited as part of the show Dig Up My Heart: Artistic Practice in the Field curated by Shauna McCabe at the Confederation Centre Gallery in summer 2010. Alice Angus joined DodoLab in Reijka in June 2010 to research a new video installation and series of works on paper about Rijeka Market and its many traders. Dodolab are working in Rijeka in 2010 with the city and local groups to explore perceptions of Rijeka, collaboratively examining ideas about the city and its future with a particular emphasis on the role of young people. Proboscis collaboration with Dodolab grows our work with RENDER, Andrew Hunters previous project. Our past collaborative projects have included At the Water’s Edge, a new work specifically for the atrium of the University of Waterloo School of Architecture in Cambridge exploring the social, cultural and natural histories of the Grand River; Anarchaeology and The Accidental Menagerie.